Petite 4 x 2.5 x 4" Jewel 6 x 3 x 6" Cub 8 x 4 x 10" Filly 12 x 5 x 12" Medium 13 x 5 x 10" Wine 4.5 x 4.5 x 13"
Buy More Hot Stamp Gift Bags Save More! These high-end bags are hot stamped with metallic and gloss foils. These bags are made of heavyweight paper and have coordinating cord handles, with cardboard bottom inserts for added strength. 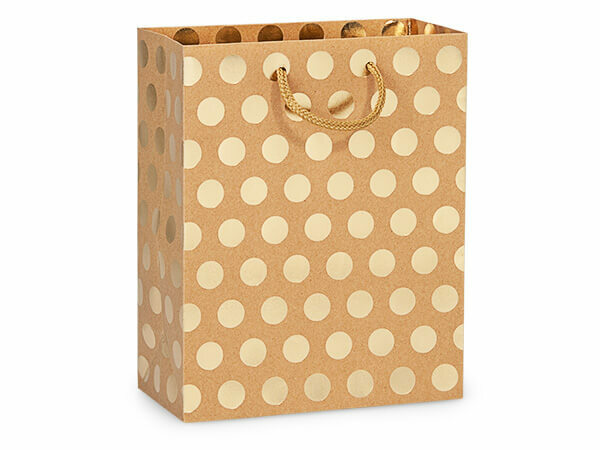 The gold polka dot bags are perfect for wedding gifts, Christmas gifts, or for use as a retail store bag. Each bag has a UPC barcode on the bottom for easy resale as well! Choose either the striking red lips stamped on white or the metallic gold hearts on red for the perfect Valentine's Day gift bag. Our mustache hot stamp bags are perfect for the man in your life, whether it is your husband, father, or adorable baby boy. These bags are perfect for use in a barber shop, as a favor bag for a baby shower, or for the little man's 1st birthday party!